Though Commodore tape systems are quite reliable, if you're having problems LOADing programs which were not SAVEd on your cassette drive, the culprit is probably head alignment. Here's a simple technique to eliminate most of the trial and error from the process of PET head alignment. 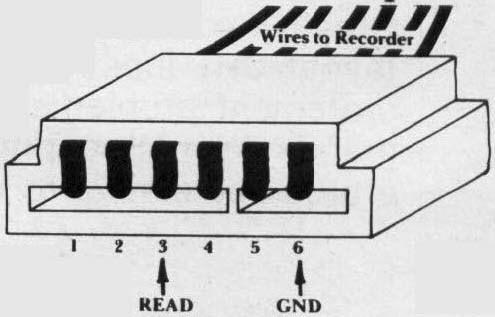 Connect an audio amplifier between the READ and GND pins on your tape player. (See Figure 1.) This will allow you to listen to your tapes as they are loaded, or even when the tape is running under manual control. Then do your head alignment while the tape is running. As you turn the adjustment screw, the sound quality will make a definite transition from mushiness to crispness and back to mushiness. At the center of the crisp area, the tape and the head are in excellent alignment, and LOADing should be easy. I have used this method for several months and have found it to be useful for aligning my head to any foreign tape; then by using one of my own previously recorded tapes, I can easily return my head to its original state. If you are using an amplifier to produce sound with your PET, that amplifier will work perfectly for head alignment. I use a Radio Shack #277-1008 cigarette-pack-size unit that I bought for $11.95, but almost any audio amplifier will do the job. The cassette connector's READ and GND pins are identified in Figure 1. They are also plainly labeled on most PET printed circuit boards, right at the place where the recorder connector plugs in. You can make your connections to these pins by temporarily inserting wires or straightened paper clips into the back of the connector, where they will be able to touch the metal pins, or by contacting the appropriate points on the printed circuit board itself. Connect the shielded or grounded amplifier input wire to GND, and the other one to READ. The voltages on these pins are very low, so there is no electrical shock hazard, but for PET's sake you should be very careful not to touch READ and GND together, or to apply any external voltages to these points. An extra benefit of connecting the audio amplifier to the tape deck is that it lets you hear whatever PET hears. I've found this to be exceptionally useful for detecting defective tapes, for guaranteeing good LOADs, and for telling when PET is searching a blank area on the cassette.